This article outlines the average 4 month old baby schedule, including feedings, solids, naps and night sleep. Pediatricians disagree high and low about when a baby is capable of sleeping through the night and only a handful of parents who reach this page will have a 4 month old that sleeps all night without even a single feeding (those that do are LUCKY!). At this age, if you are not lucky enough to have a baby who sleeps through the night, many 4 month olds are still waking 1-3 times to eat at night and many will continue to eat 1-2 times until 9 months old. Anything more and likely you have a sleep association problem. If your baby has recently started sleeping worse, you may want to read my article about 4 month old baby sleep. If you’re having trouble with naps, you might be interested in helping your baby nap. 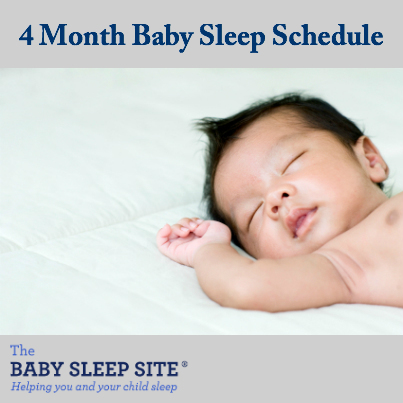 Keep in mind that one of the biggest sleep challenges families face around 4 months is the 4 month sleep regression. 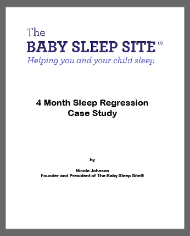 You can read more about the 4 month sleep regression here and here. Obviously, all babies vary, but here are some sample (loose) schedules you can use to make your own for your unique baby. Most babies, at this age, can’t be on a strict schedule because many babies are still taking shorter naps while their brain matures and they simply can not stay up very long to get to the next scheduled nap-time, so at this age, it’s likely naps are still on the short side, but come frequently and every day will still likely be different. Don’t worry, that will change! Most babies can get down to just 3 naps around 6 months or 7 months. I should warn you that I am in the camp that breast milk or formula should be the primary nutrition for the first year and solids come secondary. Below are the amounts we recommend if your pediatrician recommends solids before 6 months, the age at which most are recommending now. For more information on starting your baby on solid food, visit our sister site, Your Baby’s Start To Solid Foods. It includes recommendations about how and when to start solids, as well as helpful information on food allergies, recommended products, baby-friendly recipes, and more. Note: Don’t worry about feeding this much right away! You will start with just 1 teaspoon of dry cereal (before mixing w/ breast milk or formula) and work your way up. Don’t forget to wait at least 3-4 days before introducing a new food for food allergy reasons. “Thank you for your articles, they’ve shown me that my 4 month old baby is perfectly normal and I’m doing the right things in relation to his sleep. This is such a relief! So many sources just don’t seem to give realistic information about baby sleep – not for myself or for any other mum I know. This schedule assumes baby can stay up 1 hour 15 minutes before needing to sleep again. At this age, wake-time should be 1-2 hours TOPS, to avoid baby getting overtired. What is your 4-month old’s routine? Share below! My son, 4 months 4 weeks, is really struggling with getting to sleep. We’ve been trying to get down a schedule but are struggling. We start bedtime at 7, usually are able to get him to sleep by 9 after lots of crying on his part when he gets laid down. We usually have one wake up at night between 3:30 and 5 and then he’ll go back down until 9 with no problems. Naps anytime I try to put him in his crib he’ll cry, and if I manage to get him calmed enough to go to sleep he’ll only sleep for 20-30 minutes, so I often end up holding him while he naps trying to keep him from getting so overtired at night. Not sure what I can do to improve naps. @Jennie – Thank you for reading and for sharing with us. Managing a 4 month old’s schedule can be super challenging since babies this age can still be a bit unpredictable. The best thing we can suggest for helping your baby sleep better and manage through what you’ve described is to come up with a plan that you can stick to consistently for getting him to fall asleep at night and during the day. Finding a plan that works for you and your little guy should be helpful in getting him on a better schedule (if needed) and supporting him through learning how to sleep independently at the right times during the day and for a longer period of time. If you find you need or just would like more support, please let us know and we’d be happy to help! Hang in there, Jennie! 4 months old baby girl, exclusively breastfed. She usually sleeps 11 hours at night. No night feedings for a few weeks now. She wakes up once at night (usually between 2a-3a) and fusses for a little bit, but is back to sleep within 20 minutes). Seems to be working out ok..except for her last nap and the middle of the night wake up. Thank you for visiting The Baby Sleep Site! It sounds like your baby is doing really well for her age 🙂 It is totally normal for the later naps to be a little different every day at this age – most babies are not on a full-day, solid schedule until closer to 6 months-old. We recommend keeping wake time, first nap, and bedtime the same every day, and it sounds like you’ve got that down! Starting today Meaning I’m getting prepared to jot down her feeding from that time. Hi, my 4month old sleeps from 6pm usually he has 3,4h of uninterrupted sleep but then he wakes up every one or two hours. Definitely a sleep association. During the day he only falls asleep if rocked and for about 30-45 min and during the night he wakes up i feed him horizontally and back to sleep. Have two questions :what is the association that is the problem? And two, if he wakes up at 4,5 am it means he went to bed too early or its just his schedule? Good luck Venera, and contact us if you need any assistance! I have a 3 month old that pretty much follows your 3 month schedule (eat 7pm nap at 8pm, bath 9pm, eat again 10pm and bed for the night 10:30-11:30pm) … how do i start bedtime 6:30 now? Should i expect her ‘cat nap’ at 8pm to be a longer stretch slowly? Possibly move her bath time to 5:30 from 9pm? Thank you for your comment and for visiting The Baby Sleep Site! It is completely normal for a 3 month-old to still have a very late bedtime. As she approaches 4 months-old, she will likely start going to bed earlier herself, by extending that late nap into the night, and possibly dropping the 10PM feeding. Almost all babies will do this on their own, without any intervention needed 🙂 I hope this helps, but please get in touch if you need any further support! Aw, thanks Amelia! I’m glad to help! This schedule is SO helpful! Thank you. It’s also helpful to read that it’s normal to have 1-2 night feedings still (of course everyone I know with babies the same age are sleeping through the night!). I have problem with my 4 months Baby she doesnt want to sleep in bed . Everytime I put her she Will Wakes UP. So I have just carrying her the whole night so she can sleep good. Thanks hope you can give ME an advise if IM doing right . If you need more help, let us know! Hang in there! My son turns 4 months next week. He’s already started waking in the night again hungry after a blissful few weeks of 10.30-6.30am! He’s always been a good sleeper and easy to put down for daytime naps but this has changed in the last week! He usually has 3 naps in the day one 2 hrs the other two about 30-45mins. He’s a hungry baby but I want to wait til he’s at least 5 months before solids. The evenings are his fussiest time. He has bath book bed and then bottle, then a whole another bottle only an hour later. We started a bedtime routine at 8.30pm but he never actually goes to sleep til 10. I’d love him to go to bed at seven every night but when I’ve tried the routine earlier it makes our house miserable! I will mention as the article states above, a few wake ups at 4 months is totally normal, but if you are finding he’s waking every 1-2 hours, it’s likely there’s a sleep association and he’ll just need a little help to learn how to transition through his sleep cycles on his own. If you need more tips to help him do that beyond what the free guide lays out, please let us know! We have a ton of resources that can help you get through this and get back to longer stretches of sleep for all of you. Hang in there and let us know if you have any other questions! The feeds seem to be so frequent!! How much should they have in each bottle? Hi @Maree, thanks for writing to us. That answer will depend on the size of your baby. As the article mentions, your baby will need about 2.5 ounces of formula for each pound of weight (if you are pumping it would likely be similar – I’m not sure on the conversions as it may be a little more so I’d google that if it applies to you), but that will total between 20-30 ounces in a day so you will need to divide it up accordingly. You may also find that your baby is hungrier at certain times and may want a bigger bottle at certain times rather than others it may be more of a snack. I know that can be frustrating as the milk can go back, but I’m sure you’ll be able to find your groove! Hope this helps, please let us know if you need anything else! Hi @Heather – Thank you for writing!! Yes, the 3 and 4 month schedules are different. At roughly 4 months, most babies change in the way they sleep. Watch your baby’s cues, and change her schedule little by little when she begins to show signs of moving towards the 4 mo schedule. All babies do this at different ages, and feel free to make the schedules your own and find one that is a perfect fit for you! Have happy holidays and please contact us if you need any assistance! We have a 4 month old, exclusively breastfed. 5-5.30am: wake up (not ideal but our toddler wakes at 5am too and we generally start the day early as a family anyway eg husband leaves for work at 6.15). She seems very awake, alert and smiley at this time. 7-7.30am to 8.45-10am: first nap. On the four days a week the toddler goes to crèche, I wake the baby at 8.45 so that we can take the toddler. If I don’t wake her, she can sleep up to 2.5 hours. Then, feed, play and feed again for usually no more than 2 hours. 10.30-11.30 to 1-2.30: second nap. Usually 2-2.5 hours but if she’s had a shorter first nap (less than an hour and a half), she’ll sometimes have 3 hours. Then feed, play, feed again until about 3.30 or 4, depending on when she last woke, before she goes down for a 30-45 min nap. This routine goes a bit out the door anytime there are appointments etc through the day because she doesn’t sleep real well in the car, pram etc – she really only sleeps well in a cool, dark room. If she misses her long morning and lunch nap, she’ll compensate by falling asleep at 3pm (or whenever we are home) and sleeping until she’s woken (once she slept until 10pm then I woke her, another time 8pm!). We do a feed at 5pm-ish then bath around 5.30ish. She then feeds until she falls asleep between 6.30-7. Until recently, she’d then wake up once or twice between 7pm and 5am – if she woke at 11pm, she’d wake again at 3am before waking at 5am. If she woke at 1am, she’d then sleep til 5am. During the night, I feed her, change nappy then put her back to sleep awake and she gets herself off to sleep. Now she wakes and cries about 45 mins after she falls asleep. She then doesn’t go for more than a four hour stretch without waking and crying. At worst, it is every 2 hours from putting her down to sleep – sometimes she feeds, sometimes she’s not interested. It has been like this for a week now. Do I need to look at the length of her day sleeps and the fact she’s often falling asleep on the breast (with the exception of the night feeds) as a sleep association in order to address these more frequent night wakings or should I give it another couple of weeks to see if it resolves itself? She’s a very happy, smiley baby – just a big sleeper (as I’m told her father was) through the day – but I’m less happy and smiley with these night wakings!